1. 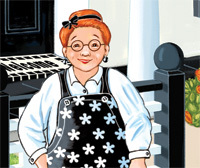 The Penguin Lady, Penelope Parker, always dresses in her two favorite colors. What are her two favorite colors? 2. 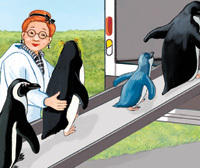 The first penguin Penelope receives walks all over her house! Where was that penguin from? 3. Where are Rockhopper penguins from? 4. One morning, Penelope picked up the newspaper to find what on the front cover? 5. 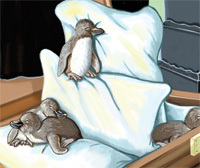 What kind of penguins did Penelope keep in her air-conditioned attic? 6. The Royal Penguins tracked muddy footprints all over Penelope’s carpets. How did they get their feet dirty? 7. In the winter, eight Adelie penguins went ice skating on Penelope’s pond. What piece of clothing did they all wear and leave in Penelope’s house? 8. What did all the Emperor Penguins snack on? 9. Penelope felt she had too many penguins in her house. Who did she call to take them? 10. 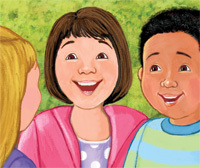 After Penelope gives away all her penguins, what does she see for sale at a neighbor’s house?